I had a robe from Bath and Body Works that had become dingy. I didn't want to buy a new one- I was ready to try anything. So, I decided to go a little bleach-crazy- I had nothing to lose, I was about to throw it out anyhow! And so I learned how to ACTUALLY whiten clothes with bleach! You'll be shocked that what seemed un-whitenable actually turns pure white! ***If you are using CONCENTRATED bleach, please use the following directions. -Run on the longest cycle you have available but DO NOT allow your clothing to soak in the water. I have been using this method for YEARS now and each time I do it, I'm like "MAN! Miracle whitening and cleaning going on here! So glad I know how to do this!" Sidenote: A few weeks after I wrote this, I started using DIY OxyClean that I just made at home- and while bleach is good to freshen up and whiten clothes, this DIY OxyClean just blows it out of the water in terms of stain remover. DEFINITELY check it out, especially for delicate fabrics. Any suggestions for people who have a front load washer? I can not open my washer in the middle of a wash setting. Your machine should have a spot at the top to add your detergent through, you can add it through there. There may even be a spot for bleach in the detergent dispenser. My detergent dispenser, I can tell you, will not hold 4 to 5 cups of bleach! I will try just soaking for a few hours in the sink with hot water. I have a 5 gallon bucket that I use to pre-soak my clothes in. First, I wash the bucket out; Second, I add the hottest water I can (if you are going to soak clothes that are prone to fading or delicates, USE COLD WATER ONLY) get to 1/4 of the way up and add either 1.5 to 2 cups of bleach OR my preferred method which is a couple of scoops of OxyClean (you can also get the off-brand of OxyClean at the Dollar Store or Dollar Tree for just $1.00!, and a little bit of laundry detergent for good measure; Third, I fill the rest of the bucket with the hottest water I can obtain. I then take a clean old broom handle and auger the clothes around for a minute or two. I let the clothes sit for approximately 2-4 hours, intermittenly augering them about to keep the clothes evenly saturated. When I feel that they have soaked long enough, I pour out the water from the bucket, then fill it back up with fresh, clean water to rinse the bleach out of them, repeat this step a few times. I then wring-out the water and add them to the washing machine and wash as directed according to my washing machine's reccomendations. When I dry my clothing, I do not turn the dryer on the HIGH HEAT setting, and I take the clothes out just before they are completely dry as this helps to prolong the life of my clothing. NOTE: Never attempt to bleach anything that is an expensive delicate, silk, cashmere, lingerie, tuxedo wear, etc. Always take these items to a dry-cleaner! For those people who are washing Uniform items such as: Military, Police, Fire Dept., Private Society (Freemason, Marine Corps League, Elks Club, etc. ), ALWAYS TAKE TO A PROFESSIONAL DRY CLEANER!! Why not soak clothes in super hot water an bleach in a large plastic tub or in the sink? I have a front loader too, so that's what I do. It works just the same. What will happen if you have colored thread or something? If you have colored threads, sometimes the bleach will whiten them entirely. Did this and the bleach ate ALL of my clothes... i only let it sit for an hour... now im out 10 white shirts..
That is a HUGE bummer and I am so sorry to hear that! 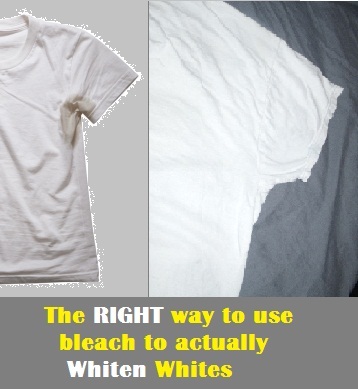 This method of using bleach really is only for sturdy white fabrics, not delicate or old fabrics. If you are in doubt, put a small piece of the shirt in the bleach water and let it sit to see how it stands up to it. If you have any qualms about the fabric, boil it instead in the DIY OXYCLEAN from above - I used bleach on some antique lace and it literally turned to pulp- but I had no issues whatsoever with antique lace and other sensitive, old fabrics using the DIY OXYCLEAN. I did it and it worked great, not sure how this guy messed it up that bad. Operator error. I am very skeptical on allowing shirts to sit in bleach. Yikes! I prefer the old "Ask Heloise" method. It saves the shirts w/ a little bit of color from being ruined. Your whites turn out bright. Adjust for HE washers. I don't have one, so I'm not sure how you'd do it, but I'm sure my friend Google would know. ive been doing this for a long time, but it doesnt have to sit for 2 hours or use that much. that much bleach will eat through your clothing, and ruin them. if anything use about 1 cup and soak for 10-20 minutes, add your detergent then wash.
That is WAY too much bleach. It may have worked great for a robe because of the thickness, but regular clothing will be destroyed. You may not see it immediately but after several washes you will start to see a breakdown and thinning of the fabric and subsequently, holes. I used to soak my whites, sturdy ones, in 3/4 cup bleach and hot water and even then I started noticing damage. Vinegar and baking soda are a great, safe alternative if bleach isn't doing enough. 1) Throwing any dirty clothes in the washer without first pre-treating and then a cold pre-rinse/wash - imho - is a recipe for disaster. Hot water can set any stains and discolored areas. 2) If you do a cold rinse, or for heavily stained whites, an actual cold wash with soap first then the hot wash works out MUCH better. 3) Soaking for hours in bleach isn't necessary, nor is the amount. If your clothes are that dingy then use other methods of whitening AFTER the cold rinse/wash. A 1/2 hour soak with the amount of bleach your equipment manufacturer recommends is best. Bleach is an oxidizer and over-bleaching WILL oxidize the rubber gaskets and plastic parts in your washer so expect earlier failure if you over-bleach. Not sure what that does to the warranty (and believe me - if you're an apt dweller, your apt manager WILL care). attention(time) + work(effort) = results. There are a lot of suggestions in the Comments at this page. Don't the clothes smell like bleach? I have a white sheet that was over bleached & I've washed it numerous times & it STILL smells of bleach! Yes, it will definitely smell like bleach after washing the first time, but after subsequent washes, the bleach smell always went away. I followed your approach and saved my dress for a little longer - thanks! My issue: I had a dress that I thought was white that picked up red spots from a shirt when I washed it with my colors. I took it to a dry cleaner who said the dye stains would not come out, though he tried. But I loved the dressed so kept it. Then, this week, I said, let me try bleaching it and I put bleach directly on one of the red spots. It took out the red...but also left a whiter white spot. When I washed the entire dress in partial bleach (1 cup per load), the other spots also came out but now I had bleach spots. (1) Don't ever put bleach directly on off-white clothes. (2) Even for pure whites, it will eat at the fabric eventually. (3) Create your bleach blend first - even in the washing machine. (4) If you follow the blog above, make sure to rinse twice and probably don't wash that particular clothes with other clothes (other than pure whites) in the future. (5) Expect that the clothes won't last as long in its new pure white form. Be warned! Your clothes will NOT last long this way. The bleach will break them down fast. That is a lot of bleach. I wouldn't even be able to be in my house with this smell from this much bleach. I would like to add the following as far the use of bleach. If your household is on a septic tank, that much bleach will kill the bacteria needed in the tank itself, causing you spend hundreds of dollars to have the tank emptied and/or fixed. If you're on a sewer, that much bleach usage contaminates the water, more than purifying it, or cleaning/disinfecting what's around it. Will this method work for a white down comforter or do you think it is too big ? Bleach will not mix with the feathers in a down comforter. I would go with OxyClean soak (you can soak in a strong OxyClean solution overnight), wash as normal, then hang out to dry. Sun also helps remove stains and odors. If you can't hang outside, then regular dryer. But first and foremost, I'd go with whatever the label says for care. You are going to need a machine large enough for the comforter to slosh about in the water and get clean. I couldn't do it in my home machine. IF I were to have a down comforter (I'm allergic, so that's a big no for me) I would be taking it to the cleaners and letting them fuss with it. I bleach towels, both kitchen and bathroom. We only have white towels in the bathrooms (for that very reason). The kitchen ones look a bit faded. And yes.... they wear out at a faster rate than if I didn't bleach them. But by "faster" I mean they only last a decade. I also bleach our cleaning rags. It took nearly 20 years before I needed to start replacing those. And those mopped up everything. Including barf, dog pee, kid pee, and bleach spray on the toilets. Not to mention the actual action of scrubbing. But I'm using the 1/2ish cup into the water and not soaking in bleach. Anything that needs to be de-dingy'ed gets an OxyClean soak. Five cups of bleach is excessive and will break down fibers. I wouldn't mix bleach with anything but 100% cotton. Hi, all. Just wondering if I need to run an empty rinse cycle after this one with the bleach before doing regular (colored) loads? Thanks! Yes, that is a must. Also let the empty rinse cycle be set at the hottest water setting available on your machine. That will ensure that the bleach is thoroughly rinsed out of the machine. Alternatively, you can wash light coloured clothes like beige etc., that are colour fast, so that the bleach remnant is thoroughly used up by the light coloured clothing and you are left with a machine that is not only clean but also free of the bleach remnants. I would be afraid to use that much bleach, but I always use an overnight Biz soak for yellowed/dingied items. I've never had much success with OxyClean...not sure why. As far as bleach does go, just as Chukka mentioned, it works really well to do a lightly colored load (and/or whites you don't want to bleach directly and/or whites with other colors) directly after/following a bleached load (towels only, for us)...gives the light load a tad of bleach with no visible damage, gets the bleach residue/remnants out of the washer, so as to not damage a colored load, and uses everything, rather than having the waste of running an empty cycle to achieve the same result. I do that empty load thing only if there's no choice (order of loads is messed up for some reason). I also use diluted bleach (about half & half) to get mildew spots out of light non-whites...gotta be vigilant tho...can't leave unattended/forget about it. Then lemon and sun to top it off, which, alone, is never enough...gotta go with at least a little bleach, which kills whatever bacteria causes the spots anyway ��. I'm gonna try that Ask Heloise recipe tho! I actually got on here in the first place to see if it's safe to let fully bleached items (bleach directly poured on dry item) just air dry without rinsing...and leave/use it that way. I did this with a dish drying mat and just didn't want it eaten through, or to accidentally transfer too much onto our drying dishes, and thereby to us. Friday: Kiddo DIY Fun Toy!